Liquidations-Good or Bad? - Chris Malta. There are a lot of so-called EBiz "gurus" out there who tell you that you can make a killing online buying and selling liquidated products. They tell you that you can buy them for pennies on the dollar, then turn around and sell them at retail on eBay, Amazon, and so on. To most people who don't have a lot of experience in retail, that sounds pretty exciting. To those who DO have experience in retail, however, buying and selling liquidations is about as exciting as putting on a $3,000 pair of Christian Louboutin sneakers and accidentally stepping in a mud puddle. First, you have to understand that there's a lot of risk involved, even if the "liquidation" price seems low. Liquidated products (also called “secondary market goods” to make the whole thing sound a little less horrifying) come from lots of sources. They COULD (rarely!) be factory overruns that never left the manufacturer or last year’s models that were never sold at the retail store. Much more likely, though, they're customer returns to big-box stores, used products such as old computers or other outdated electronics, incomplete or damaged scratch-n-dents, etc. There are lots of web sites that advertise liquidations. The web sites themselves, no matter how good their reputations, do not control the actual liquidation sales themselves. They don’t even check out the legitimacy of the liquidators advertising on them. That’s on your head; you’re the one who has to make sure you’re not getting burned when you buy. You could easily end up with a "waste factor" of 20 to 30% or more. "Waste" means products that are damaged, dented, non-functional, dirty, torn or generally useless for one reason or another. Of course the damaged boxes that contain the waste will almost always be hidden out of site in the middle of the pallet you buy. On top of all that, always remember that liquidated products are liquidated in the first place because nobody ELSE could sell them at retail! Second, if you're buying liquidated product pallets, you're most likely trying to sell those products on eBay or Amazon. If you've been told that selling on EITHER of those platforms is a good idea for a home-based business owner, go get some of those $3,000 Louboutin sneakers and look for a mud puddle. At least that won't be as disapointing as finding out that there are no profit margins left for home-based business owners on eBay or Amazon. Third, no matter where you try to sell liquidated products, the fact that you're carrying physical inventory is going to hurt your business. Selling online SHOULD be a situation in which you NEVER actually touch a product. You should NOT be cleaning, packing and shipping somebody else's one-off leftovers one at a time for a miserable profit. NOT an effective business model. Fourth, the only people making any real money in liquidation are the brokers. The ones you buy the pallets from. The bigger brokers buy TRUCKLOADS of liquidation pallets all at once at REALLY low prices from big companies that couldn't sell the products for one reason or another, SIGHT UNSEEN. They do NOT inspect those individual pallets. Then they unload them on YOU at a profit without even looking at them, and YOU'RE the one who gets to deal with all the heartache of trying to sell that junk at something approaching an individual profit margin that MIGHT get you a beer and a bag of chips if you're lucky. Look, if you're going to be in business, BE IN BUSINESS. Forget about the gimmicks and all the other crap that sounds too good to be true. It IS too good to be true. Get away from eBay and Amazon. Learn how to plan, research and start your own website, where you actually are your own boss. Sell NEW products that people actually WANT from real manufacturers and wholesalers. Use drop shipping so that you don't have to invest any money or handle the products physically. That's how the people who make money in this business actually make that money. Anybody who tells you different is lying to you. Simple as that. 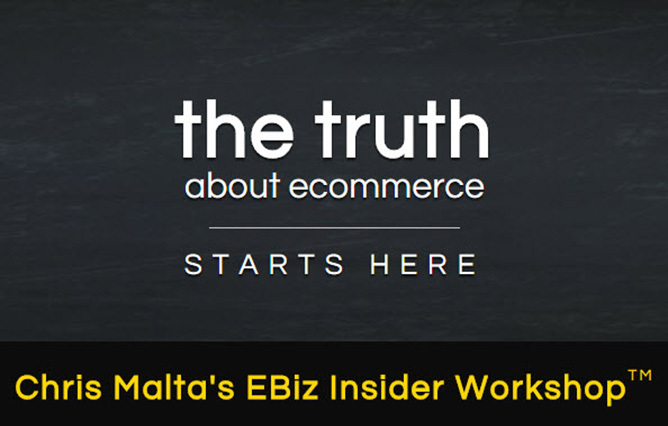 For much more no-holds-barred real life EBiz information, check out my FREE EBiz Insider Video Series.